Live performances verse DJ sets are both amazing to experience, but in different ways. Seeing a musician or band express themselves through different mediums is like seeing the legendary Hugh Jackman star in a movie and then catching him on stage for a musical in a theatre. Neon Indian, likewise, a master of their craft for indie dance music, was a performance that I could not miss and being a DJ (and music lover), myself, I was excited to see what was in store for their DJ set at Exchange LA. If you haven't been to Exchange LA or don't know what it is, here's a little background. The building began construction in 1929, just a few days before the stock market crash. It's prime location is on Spring Street in Downtown Los Angeles. In 1931, it opened as the Los Angeles Stock Exchange, 35 years later it became the Pacific Stock Exchange, and in 1986 the facility made a final move from the location. That's right, the dance floor was once used for trading stocks, but now trades memories of legendary performances. The halls that once echoed of shouting numbers and figures, now chants songs and melodies, with thousands of guests dancing to the same rhythm in unison. If you stand in the middle of the dance floor, facing the main stage and look directly up and to the right, you can see where the clock used to be for the trading floor. 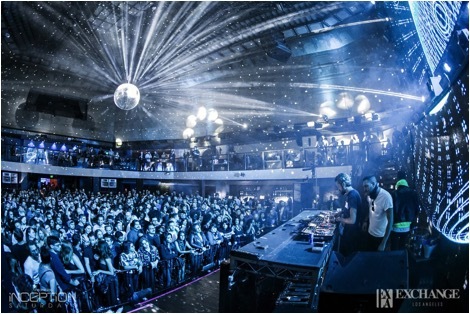 In more current history, PAX America purchased the building in 2006 and opened doors for a new dance club, Exchange LA in 2010. However, in 2013 PAX filed for bankruptcy, which paved the way for Insomniac to take over and establish the venue that we know and love today. In my opinion, Exchange LA is one of the best clubs in the city. Insomniac truly does an amazing job with the production. When you ascend the large marble staircase to the main stage on the second floor, it feels as though you have been teleported to a midnight set at the Neon Garden stage at EDC Las Vegas, also run by Insomniac. The lights and lasers are always on point, and the Funktion One sound system is a force to be reckoned with. Seeing Neon Indian at such a quality venue with great support from Holy Ghost!, Gigamesh, Rambo and not to mention MDA DJs, was certainly a treat. In the heart of Downtown, you get a true taste of life in Los Angeles, as you walk toward the venue. You can feel the bass as soon as you step onto the sidewalk surrounding Exchange LA. Immediately after walking through the door, you can spot The Gallery, a spacious side room on the first floor that typically houses lineups curated from partners. This night MDA had the pleasure of curating a stacked lineup, which included DJ Instagator, Rachel and Rozco. On the main stage, Rambo started by perfectly building up the tasty disco beats in preparation for Holy Ghost!, who took over around 11:30 p.m. The synth-pop duo from NYC held down their set for about an hour and a half before Neon Indian took the staged, which was accompanied by a roar from the crowd. Alex Polomo, the frontman for the four piece band, Neon Indian, was a solo act during this DJ set. They were named one of the best new bands in 2010 by Rolling Stone and have three albums to their name, so far. Polish Girl, off of their second album, Era Extrana, released in 2012, is the song that got me hooked. If you haven't listened to it, I highly recommend it. Even though the rest of the band wasn't there, the unique style of Neon Indian was shown throughout the set. The chill-wave and synth-pop sound with groovy basslines drove the dance floor to a fervor. When the clock struck 2 a.m., I wasn't sure if I could keep going after dancing nonstop for hours, but multi-platinum selling Gigamesh had different plans for me. Best known for producing Cooler Than Me by Mike Posner and for his remix of Foster The People's Pumped Up Kicks, he took over at 2 a.m. and carried the crowd masterfully with chill, groovy vibes until Exchange LA shut doors at 4 a.m.
Insomniac spoiled us with such an amazing lineup all in one night. I left the club feeling like I had just finished the world's craziest leg day at the gym. I want to say no more dancing for a few days... but you'll probably find me on the dance floor soon anyway. Until next time. Keep those antlers up.